If you have a blog or a website I'm happy to link to you, too. Replace the ( ) with < > and you have the code you need to drop a link into your pages. Those with a little web experience know what I'm talking about. If not just send me an email and we'll figure it out. This will also help me rank with search engines for the term "base ten blocks". Right now I am no where near page one and the pages that are, are not as relevant as my site if I do say so myself. lol Think back to how you found me in the first place if it wasn't a super excited friend, it was probably you searching for something to do with homeschool math on the internet. This will help others find me too...again people ask how can I help spread the word. This is a good way but things as simple as hitting like or share or mentions in whatever social media you use helps quite a bit. Reall, every little it helps. You can pull stuff off my website or this blog too if you have a blog or website that needs content, again just give a link back to where you got whatever it was from...to include text. EZ. People also always ask me, what do you mean "just play with base ten blocks?" Just what I said. 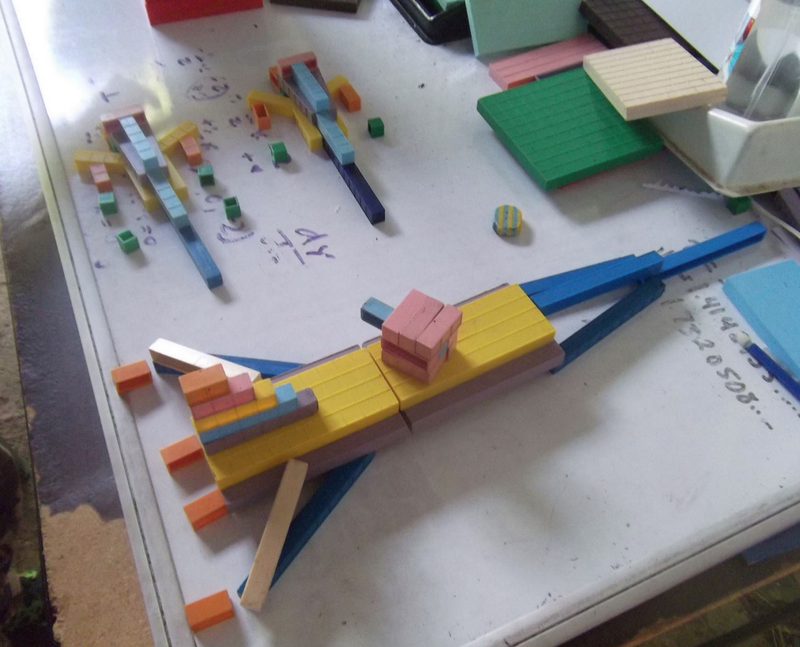 This isn't rocket surgery: just play blocks when they are little kids (roughly 8 and under but even teenagers can have fun and learn math just playing with blocks but then it moves to a reward and free time, with the little kids especially 5 and under it's pretty much ALL free time and sing songs ). And DON'T over do it by asking ALL of the questions listed 'at once' or in the same session...they should be "natural" questions. You may also take note of the child or student as they are building; they may say something like, "I need 4 fives...two for each of the smaller ships." For little kids that's 4 divided by 2...and BTW how much is four fives? 5x4. You could sing songs...whisper count, just skip count...whatever. Keep it simple and fun. Base ten blocks make math fun. How many twos on the big ship? Five. Let's count them, 2,4,6,8,10. Hey how many three's is that on the super duper laser cannon turret? . And what shape is that? Square. A fast lesson square root should be obvious and natural. What's 40 plus 40? 80. If you had to use fours how many would you need? 20. Way easier to just grab two 40's huh...? If you make a cube out of 3's how many units would be in it? 27. Hey look instead of writing 3x3x3 we could write 3³--that's called economy of symbol. What's 60 plus 60? 120. Wanna get crazy and count 120 by sixes? NO. lol Do it anyway. Lets see if we can find a pattern to make it easier. You can also see a calc lesson had gone on before this where we learned about doughnut factories and water tanks. A lesson on square roots of numbers like 2 and 3 can be seen at the nose of the big ship where we wrote out quite a few places. It's all math. Here was a fun response to build me something. This is the hull of a pirate ship...with cannons and everything. Kirk's Tutoring Get's it. You might give his FB page a like. 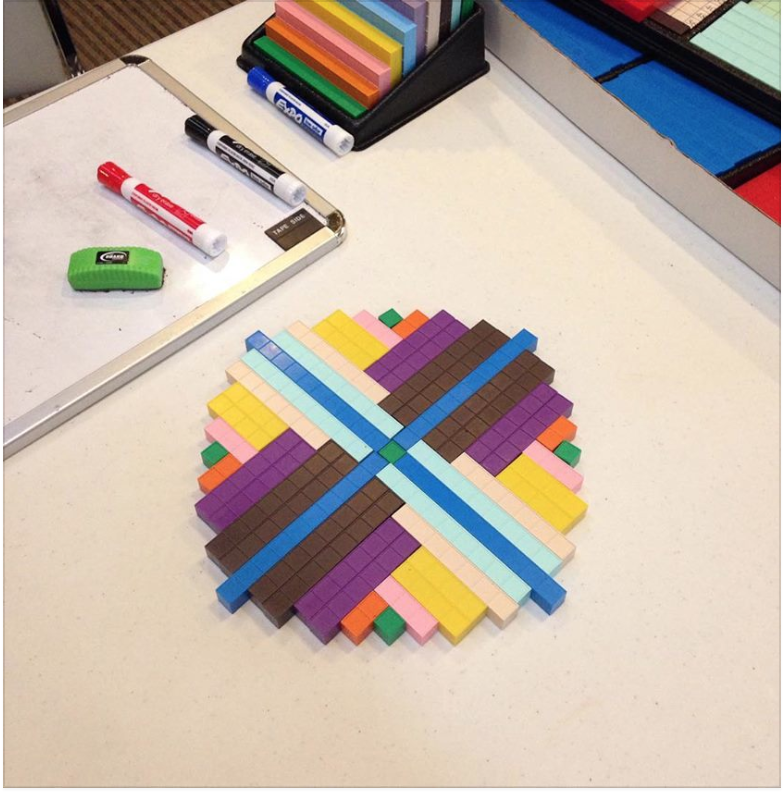 This came from Kirk's Tutoring, who also uses this method. I assume the student was given free time but gee, seems a lot of questions could be asked about his too...also note the symmetry and the observations that could be made here, and they could even just start with what the word "symmetry" means. Which is a very complex concept for the 6 and under crowd but there it is shown clearly. The work here was building a cube of hundreds made out of addends for 10. Then the kid "splendified" it by adding some hundred squares and the pyramid of multi tens on top. This is a freighter with huge engines so it can get cargo from planet to planet FAST. Here is a building with a monorail going by it. I thought it was a house with a fence but the little girl who built it set me straight. and she asked for some help flushing up the blocks, Note the addends for 4 and 9, and of course we counted by sevens, just so she could hear the pattern. 7, 14, 21, 28, 35, 42, 49...how many seven is 35? Did you hear THIRTY-TWO...? They should say something like no, but I heard FORTY-Two. Did you hear 15 or 18? No but I did hear 14...etc. He called Mortensen More Than Math for a reason. 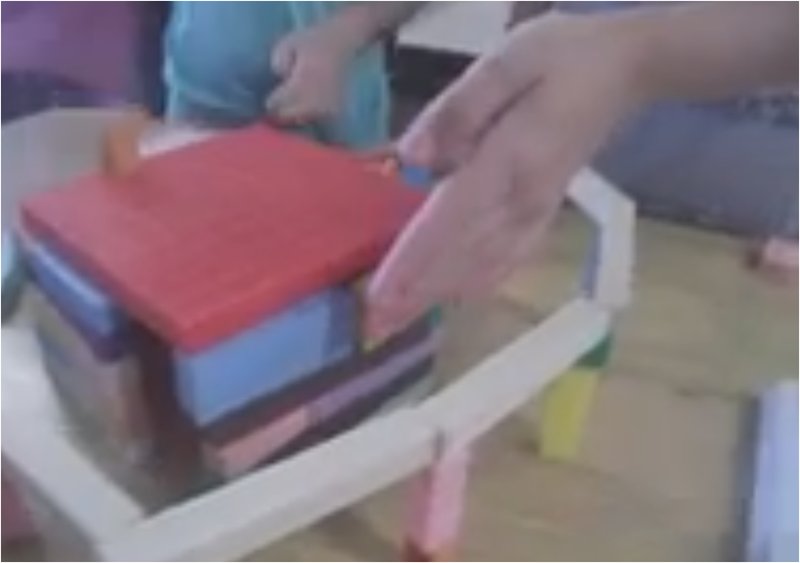 Imagination, fine motor skills AND math are developed by playing with these blocks. This page was to give you ideas...NOT BLUEPRINTS. The problem I have with doing books like this is that some of you (not all of you) will ONLY build the ones you see in the books ONLY ask the questions I list etc. You have to play and be creative; these are just examples , a vague framework from which you can get ideas and then allow your kids to be creative...and build whatever they want. As they build talk about what they did. Use some symbols to show we can use numbers to "talk" about what they did (express reality numerically). And using mathematical symbols is a WHOLE lot faster than English or whatever language other than mathematics you speak. Get a FREE book to help you get started exploring and discovering the wondrous world of mathematics as presented via base ten blocks. 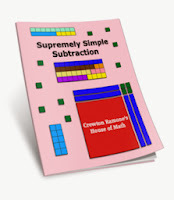 Just click this link to get Supremely Simple Subtraction delivered directly into your inbox. Thank you for this blog post! This gives me a visual example of ideas of things for my girls to build and questions to ask them. It is motivating me to "just play with the blocks" more now that I understand better what that looks like. This will help me in the coming school year! Thank you! "Today, look for cubes and squares in your child's work. Here are some phrases that can be useful..."That part of your structure is the same on all three sides...you built a cube. Its so pretty/cool. I wonder how many blocks are in it. 64! it took forever to count that. there has to be a faster way...im gonna try skip counting it...that was much faster. Now i know that anytime is have 64, i can build a cube from it! i think there's a way to write that out..." etc., etc.